. . . in Evenwel v. Abbott. 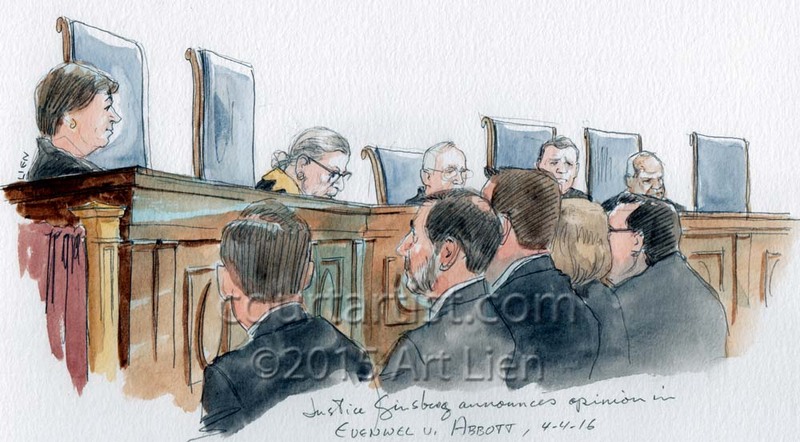 Wearing her gold, star-pointy, jabot-like whatchamacallit Ginsburg announced the unanimous decision that “one person, one vote” means Texas may draw voting districts according to total population as it does now, and is not required, as the petitioners claimed, to count only eligible voters. But the Court said “may,” not must, and the question whether it would be equally permissible to count only voters in determining districts is not settled. I also did this Hiroshige inspired banner sketch for SCOTUSblog on this lovely spring morning (the weather for the rest of the week may not be so pleasant).